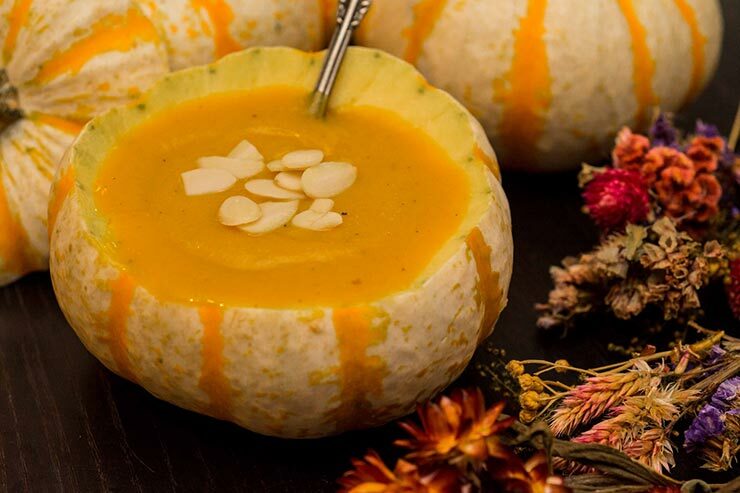 If you’re ever in a position where you have to throw a fancy party with only a day or 2 to make all of your sides, soups, desserts, appetizers and cocktails, fear not! It can be done! 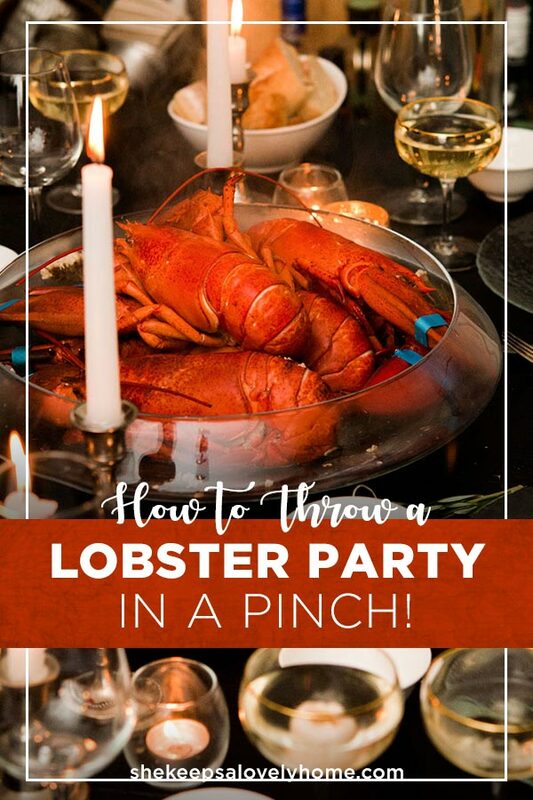 Here’s how to throw an extra fancy lobster party in a pinch! On the Menu: Lobsters! (of course), a creamy, spicy curry butternut squash soup, a heavenly pumpkin cheesecake mousse with salted caramel, beautiful deviled eggs and some lovely little snacks as appetizers. 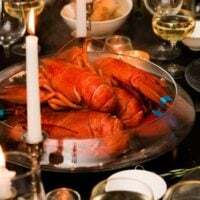 Your lobster table checklist: Forks, knifes, spoons, lobster crackers, bowls for butter and glassware – but a few more tiny touches really make your table pop, and take almost no time to add. 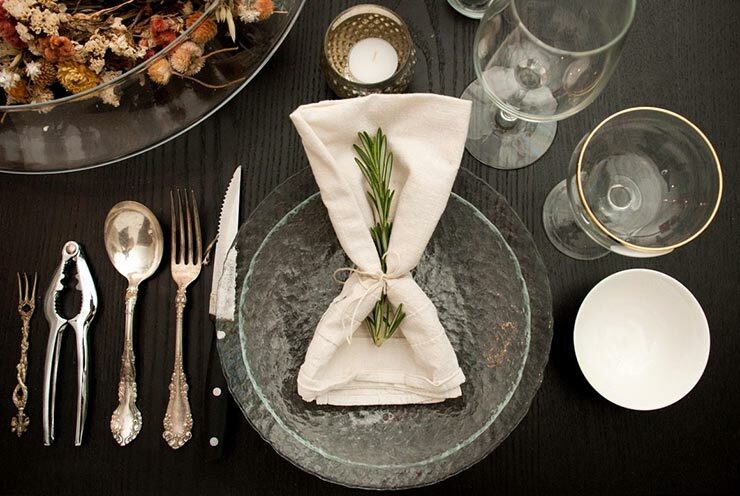 No need to go over the top with your napkins, but why leave them bare or stick them into a napkin ring when you can simply tie them with string and add a sprig of rosemary? 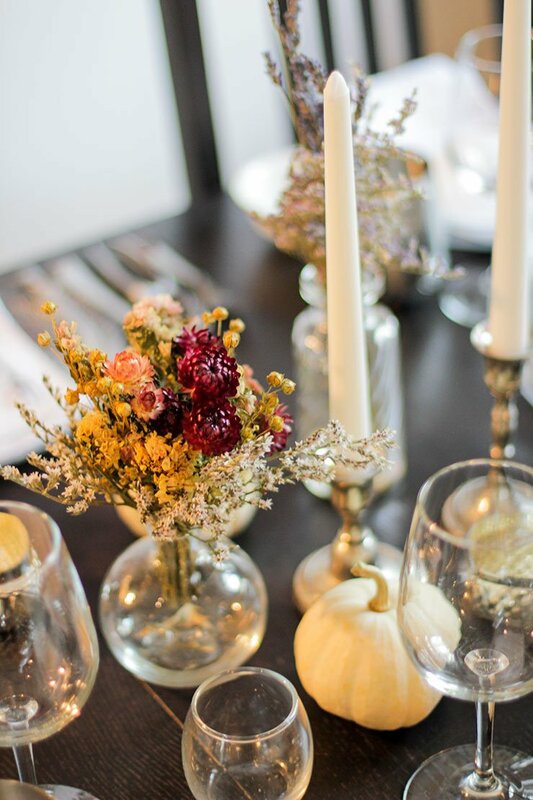 If you give the leaves a little pinch, your whole table will smell so divine! It’s a simple touch that takes almost no time and really adds some elegance to your table. 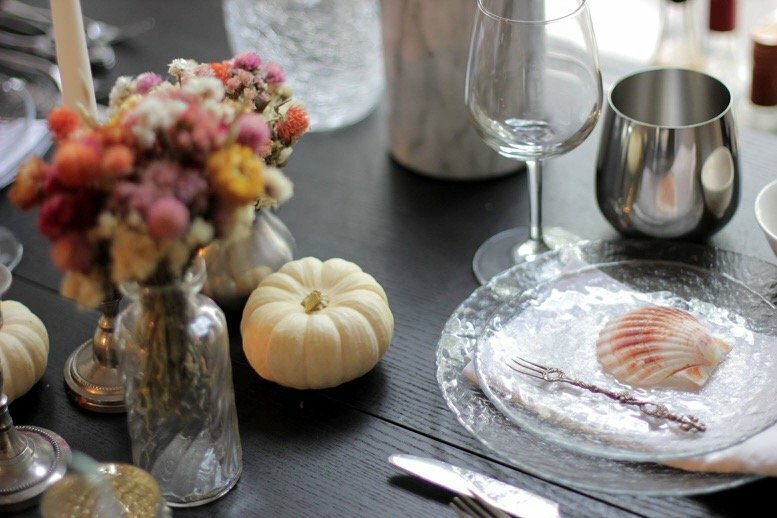 If you’re lucky enough to be serving your lobsters in the Fall, a few sweetly placed white pumpkins make the prettiest decorations, along with a few flowers in simple, small vases. And if you don’t have any rosemary handy, you can place bowls or pretty tools right on the plate instead. I thought it would be pretty to put my amuse bouche shells in the center of the plate with these awesome little tridents I found at a thrift store. 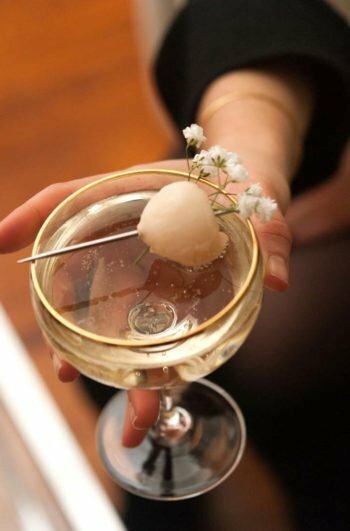 There are a few cocktails I like to make for dinner parties with lots of moving parts that don’t take a lot of effort, but really impress the guests. 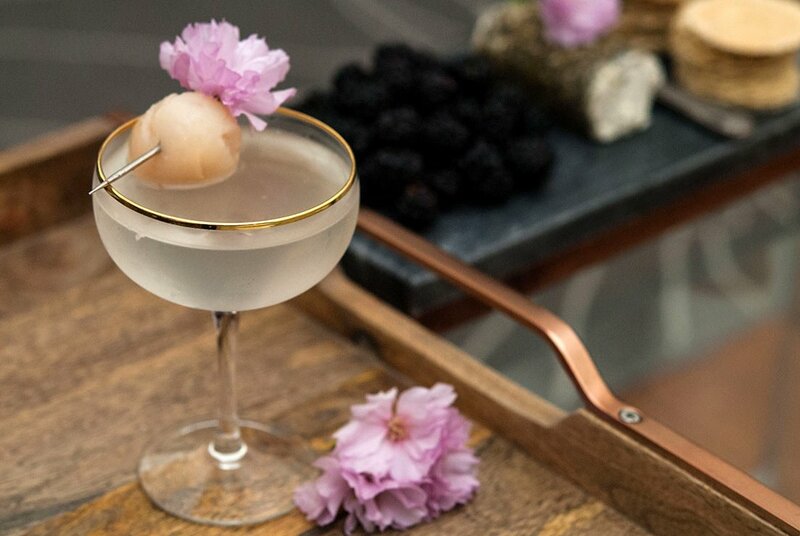 My very favorite cocktail for a party like this is a lychee martini. It’s simply sake and lychee juice. That’s it. 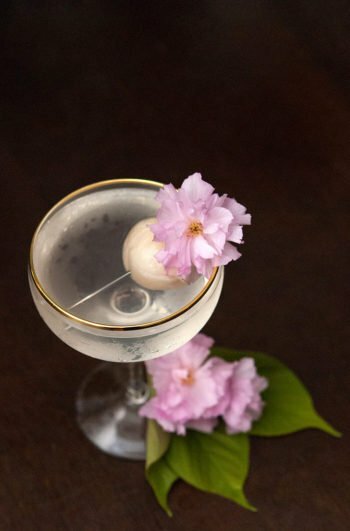 It’s SO refreshing, and easy to make elegant with nothing more than a little flower/lychee garnish. Just grab yourself a can of lychees at your food store, and a big bottle of sake. Add about a teaspoon of lychee juice to 3 ounces of sake in your shaker with ice for 1 cocktail, shake vigorously and top with a single lychee! You never want to be mixing cocktails away from your guests for too long, so make this one ahead of time and keep it in a glass bottle in your fridge. That way, you just have to simply shake with ice and serve. Serve a Show-Stopping Soup that Takes Only 1.5 Hours to Make. Everyone loves butternut squash soup, and it doesn’t take any effort to make this one extra special by adding a little curry and a spicy kick. I like making this soup for lobster dinner parties because I can make the dessert while the squash is baking. It’s as simple as roasting the squash, adding a few spices and broth, blending and setting aside for when it’s ready to serve. Real simple. 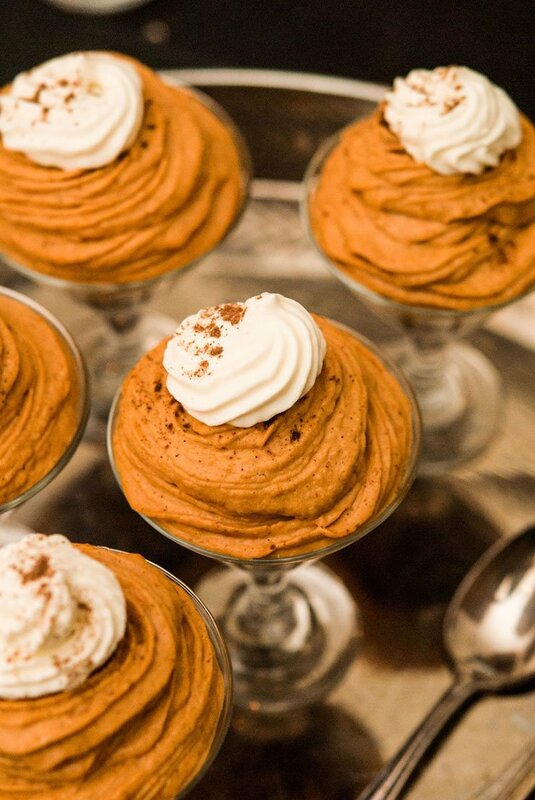 Pumpkin cheesecake mousse is one of the easiest, and most delicious desserts I know how to make. It’s so easy, it’ll be done before your squash is finished baking for your soup. I make the crumble crust first and add that to my little glasses. I pour in the salted caramel, then put the glasses in the fridge while I make the mousse. Once the mousse is done, I put it into a big pastry piping bag with a pretty tip, then seal the top and bottom with rubber bands and place it in the fridge. That way, I can pipe the mousse into the cups just before my guests arrive, and put them back in the fridge until dessert. You want to fill them within 2-3 hours of serving. 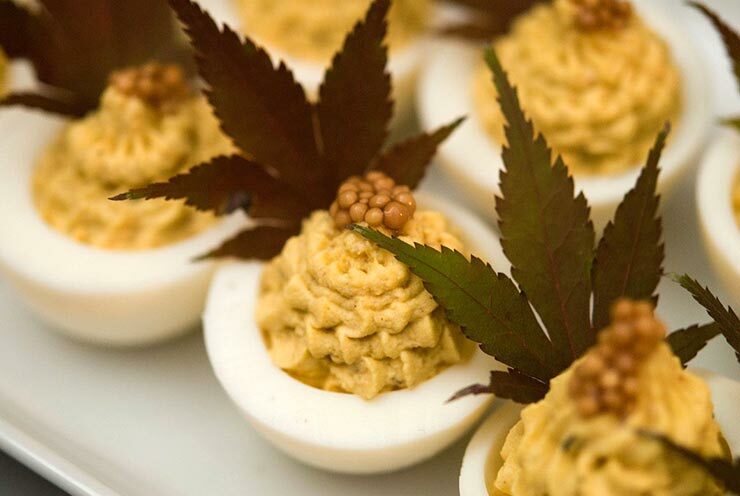 I absolutely love deviled eggs for parties. They’re so easy to make and so easy to make pretty! As long as you have a pastry piping bag, they’ll look so professional. 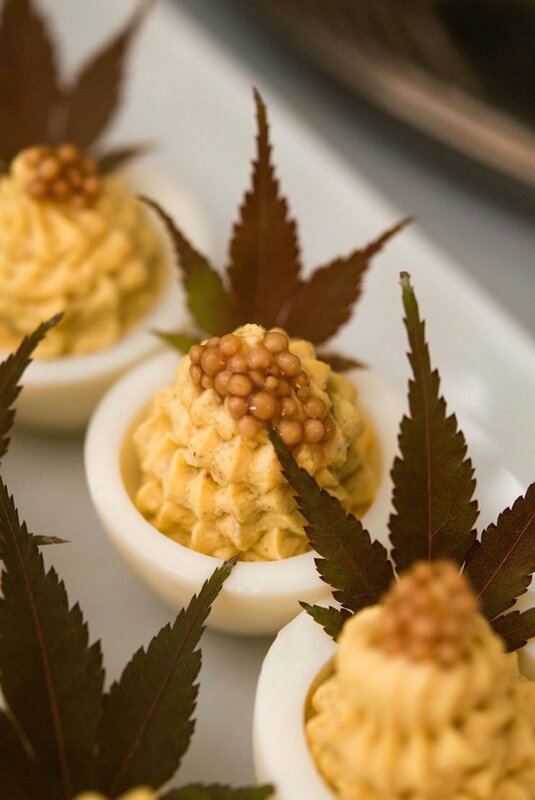 These are simple little Autumn dill deviled eggs with tiny Japanese maple leaves and pickle juice-soaked caviar. I make the caviar days ahead, then just spoon them on before guests arrive. I cut my eggs, mix the filling and put it in a pastry piping bag, like the mousse, for later so all I have to do is pull out the egg whites and fill them just before guests arrive. You don’t want them sitting in the fridge fully filled and decorated for more than an hour. Even though there are clearly enough tasty treats on the menu, it’s always nice to start off with a cheese plate, apart from your tasty deviled eggs, when your guests arrive. 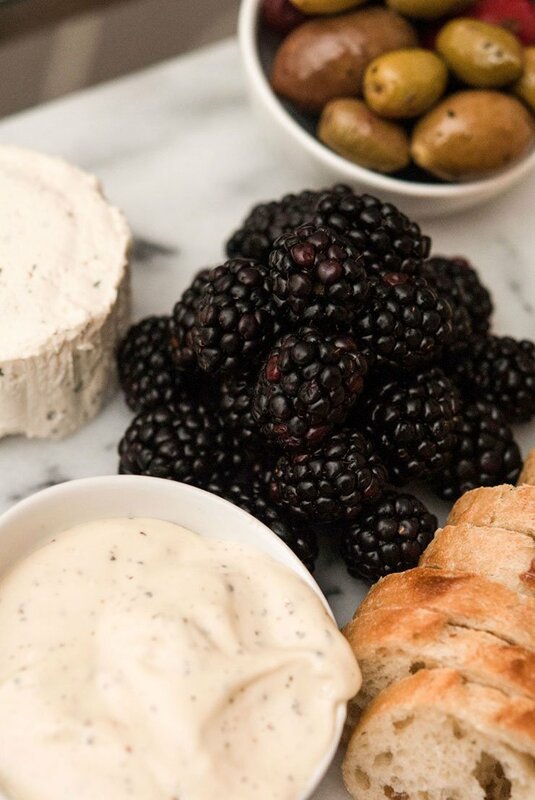 I put together this simple little cheese plate with just a few yummy blackberries, Boursin cheese, a rind-less peppered brie, a freshly cut baguette and some pretty little olives! That’s really all you need. Finally, the piece de resistance, your lobsters! Recipe Below. When you pick them up from the market, keep them nice and cold. If you can’t fit them in the fridge (I usually cant) keep them in the sink or a large bucket covered in ice until they’re ready to go into the pot. I have a hard time putting them in the pot, myself, so I get my husband to do it for me – Head first, and as fast as possible while thinking very grateful and kind thoughts. Some say you’re supposed to take the rubber bands off first before you boil them, but I say no way! A lobster almost took my husband’s hand off WITH the rubber bands still on! Make sure to budget about 20-30 minutes to bring your water to a rolling boil. It must be absolutely rolling before they go in the pot. 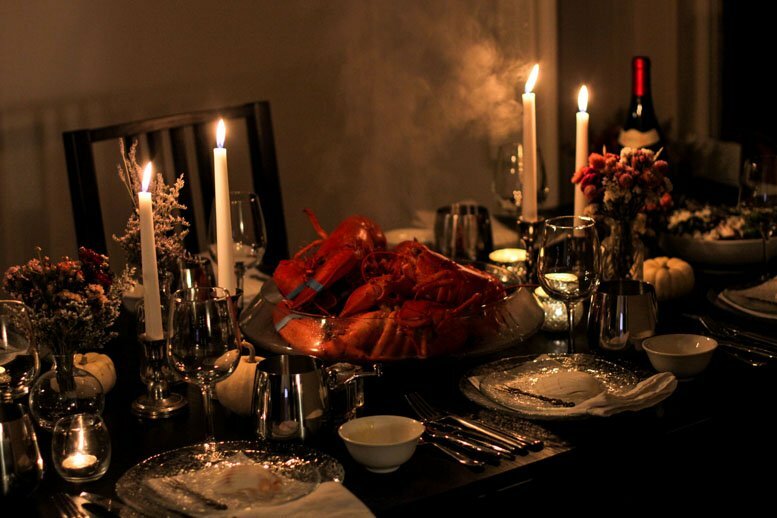 It can be really helpful to serve the lobsters in a big bowl in the center of the table. When they’re boiled, the water runs all over when you start cracking the shells. It’s nice to have one big spot where folks can let the water run out, and where they can discard the shells in one tidy place. It also makes clean-up a lot easier. You'll need 2 large lobster pots and good tongs to lift them out. You can fit between 3-4 lobsters in a standard sized pot. 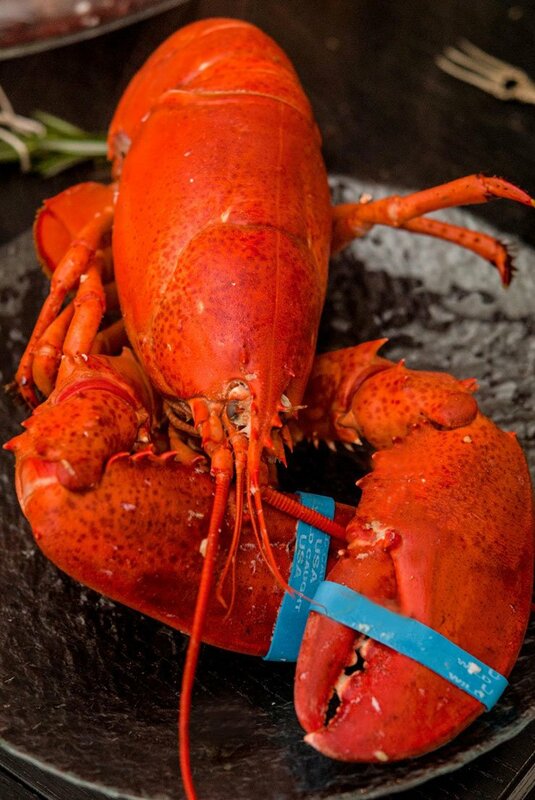 Fill your lobster pots ¾ of the way up with water and let them reach a rolling boil. This can take up to 20 minutes. Once the water is rolling, carefully (and quickly) place 3 lobsters in 1 pot, and 2 in another, head first. Allow them to boil for 18-20 minutes. 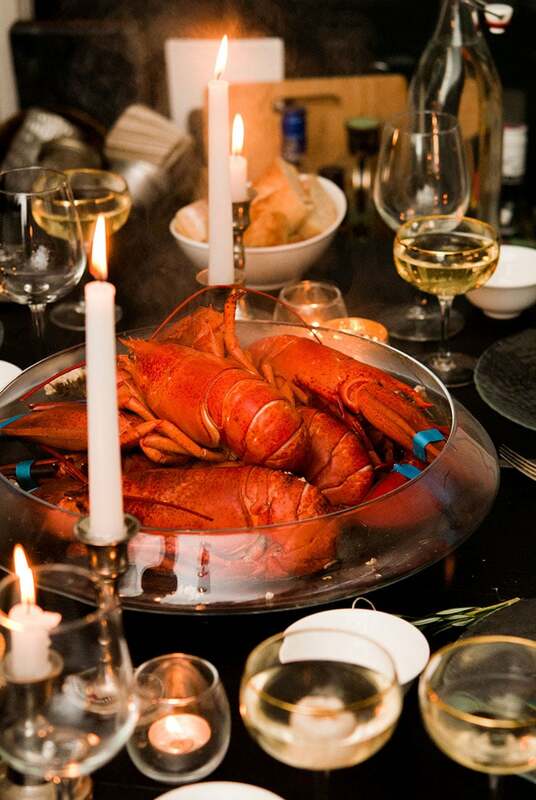 While your lobsters are boiling, melt your stick of butter and pour in your olive oil. Mix and distribute it between 5 tiny bowls for dipping. The olive oil prevents the butter from hardening once poured into your tiny bowls.